Are the alleged Indian-proposed constitutional changes consistent with the Interim Constitution? A report published in the online edition of The Indian Express, an Indian daily, on September 23, 2015 has said that New Delhi wants Kathmandu to make amendments to seven various provisions of the new Constitution, which was promulgated on September 20. India, according to the report, has said that those seven provisions of the new Constitution are against the will of the Madhesi people. Southasiacheck.org has examined whether the alleged Indian-proposed changes are consistent with the Interim Constitution of Nepal-2007, which was accepted by all Madhes-based political parties. Click here to read the report published in The Indian Express. First assertion of The Indian Express: Article 63 (3) of the Interim Constitution provided electoral constituencies based on population, geography and special characteristics “and in the case of Madhes on the basis of percentage of population”… The latter phrase has been omitted in Article 84 of the new Constitution (and) “needs to be re-inserted”. Provision in the Interim Constitution: Article 63 (3) of the Interim Constitution has mentioned that the Constituent Assembly members will be elected and nominated on the basis of the equality of population, geographical congeniality and specificity, and on the basis of the percentage of the population in Madhes. Provision in the new Constitution: Clause 1 (A) of Article 84 of the new Constitution has stated that for the purpose of electing the members of parliament through the first-past-the-post system, the electoral constituencies will be fixed on the basis of geography and population. Similarly, Clause 2 of the same Article states that the political parties while fielding candidates for members of parliament under the proportional electoral system should also be mindful of the geographical and provincial balance. Second assertion of The Indian Express: In Article 21 of the Interim Constitution, it was mentioned that various groups would have “the right to participate in state structures on the basis of principles of proportional inclusion”. In the new Constitution (Article 42), the word “proportional” has been dropped — Delhi wants it re-inserted. Provision in the Interim Constitution: Article 21 of the Interim Constitution has mentioned the term “principle of proportional inclusiveness”. 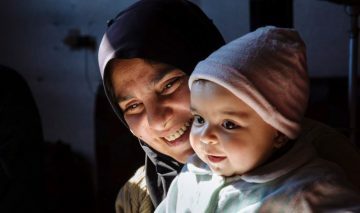 Provision in the new Constitution: Article 42 of the new Constitution has the term “principle of inclusiveness”. Third assertion of The Indian Express: Article 283 of the Constitution states that only citizens by descent will be entitled to hold the posts of president, vice-president, prime minister, chief justice, speaker of parliament, chairperson of the national assembly, head of province, chief minister, speaker of provincial assembly and chief of security bodies. This clause is seen as discriminatory for the large number of Madhesis who have acquired citizenship by birth or naturalization. Delhi says this should be amended to include citizenship by birth or naturalization. Fourth assertion of The Indian Express: Article 86 of the new Constitution states that the national assembly will comprise 8 members each from the 7 provinces and 3 nominated members. Madhesi parties want representation in the national assembly to be based on the population of the provinces. This, Delhi says, should be done to address concerns. Provision in the Interim Constitution: Interim Constitution was silent in this issue. Provision in the new Constitution: Clause 2 (A) of Article 86 of the new Constitution says that eight members including at least three women, one Dalit and a person with disability or from minority group should be elected from each province to the National Assembly. Sub-clause B of the Article has further mentioned that the president will nominate three members including women on the recommendation of the government. Fifth assertion of The Indian Express: Five disputed districts of Kanchanpur, Kailali, Sunsari, Jhapa and Morang: Based on the majority of the population, these districts or parts of them may be included in the neighbouring Madhes provinces. Provision in the Interim Constitution: Interim Constitution did not have any mention of this issue. Provision in the new Constitution: Annex 4 of the new Constitution has mentioned that Jhapa, Morang and Sunsari districts fall under Province 1 and Kailali and Kanchanpur districts fall under the Province 7. Sixth assertion of The Indian Express: Article 154 of the Interim Constitution provided for delineation of electoral constituencies every 10 years. This has been increased to 20 years in Article 281 of the new Constitution. Echoing the Madhesi parties, India wants this restored to 10 years. Provision in the Interim Constitution: Article 154 of the Interim Constitution has provision on the delineation of electoral constituencies, but the provision mentioned by the Indian Express falls under the Clause 3 (A) of Article 63. This clause states that delineation of the electoral constituencies for the purpose of Constituent Assembly (CA) election will be done on the basis of the latest census report. Since the Interim Constitution has not envisioned the election to be held after the promulgation of the Constitution through the CA, there is no mention of delineating electoral constituencies every 10 years. Provision in the new Constitution: This provision has been mentioned not under Article 281 of the new Constitution, but under Clause 12 of Article 286. It says that electoral constituencies will be reviewed every twenty years. 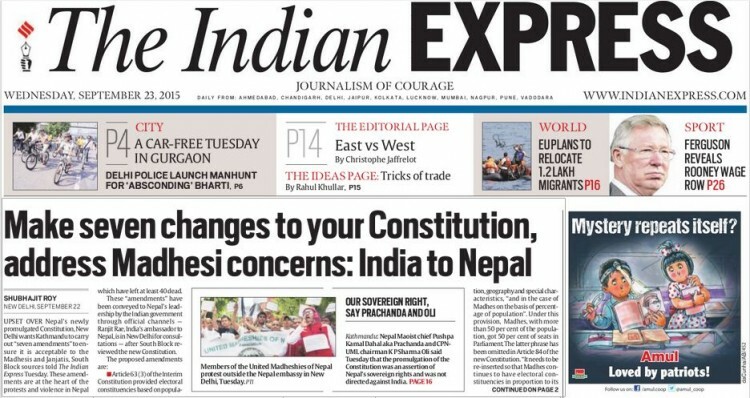 Seventh assertion of The Indian Express: Article 11(6) [of the new Constitution] states that a foreign woman married to a Nepali citizen may acquire naturalized citizenship of Nepal as provided for in a federal law. Madhesi parties want acquisition of naturalized citizenship to be automatic on application. This also finds favour with Delhi. Provision in the new Constitution: Clause 6 of Article 11 of the new Constitution has mentioned that “a woman of foreign nationality who has a matrimonial relationship with a citizen of Nepal may, if she so wishes, acquire the naturalized citizenship pursuant to the federal law”.